Graph courtesy of Elliott Wave. One of the few economic commentators to predict the current economic crisis with deadly accuracy. 300 years of the biggest economic growth spurt in the history of mankind looks incredibly impressive. But what does the future hold? When it comes to the economy the majority take the current recent trend and extrapolate it off into the distant future. Just like in 1999 everyone expected the economy to boom beyond belief, in March 2009, the vast majority expected stocks to keep crashing hard. In both cases the exact opposite was true. At the same time its incredibly to difficult to know when a bubble is going to burst, if it will keep growing, or when an economic collapse will suddenly bottom and turn into rapid growth. What history teaches is that the more people believe in one direction, the less likely it is true. Don’t believe me? Go look at some newspaper headlines from 1999 or 1929, before the crashes – consensus remained upbeat. People don’t buy a newspaper if they disagree with it – newspapers tend to reflect the general feeling of their target audience. The lesson is don’t expect the current trend to keep continuing. Sudden changes will quickly unfold and you need to forget the old times, and quickly adapt to the current situation that is unfolding. Don’t get caught in the trap. Recession, depression or boom – there are major opportunities. Understand what is going on around you, and be prepared to adapt fast. Don’t take the current trend and exprapolate it off into the far future. Don’t get caught up in consensus and the general feeling. It is usually wrong at the worst times. With the world’s economies seemingly worsening and the pundits forecasting financial Armageddon, a vast number of entrepreneurs are examining overseas relocation as a very viable option to the once , never questioned residence of good old Uncle Sugar. I have been in Costa Rica never a decade… a little after 9-11… came to retire and got a little carried away. I have been continually surprised by the opportunities that exist in other countries, especially when the States continues to become more and more restrictive to entrepreneurs. Costa Rica for example, is probably more expensive than other countries such as Nicaragua, Ecuador, or Mexico… but has much more to offer, especially in terms of safety, security , medical care and more. Interesting article. I believe we are currently in a deflationary economy which will continue for the next decade, at least. What will be required is reducing personal and public debt, generating multiple revenue streams, and holding onto our US Dollars, which will only strengthen. As mentioned, there are opportunities in every environment – this one as well! I agree, although the news and all forms of media are currently still reporting gloom and doom… I hope you recognize that their are tons of opportunities to gain real wealth. I also agree with Robert Kyiosaki when he states network marketing is the perfect business model. With all we know about IM we have an edge over the rest of the traditional networkers. 2012 will be a prosperous year for many…. Will you be one? I hope 2012 will be better than the 3 past years. Recession made our living more difficult than before. Looks like another depression is coming our way…But then again, its been a long time coming…Those who step up and tackle it will be the winners and those who take a step back and try to horde their money will be the losers. All the big entrepreneurs generally say that this is the best time to go for it and this is the time where the most money is to be made so we’ll see who comes out of it and who doesn’t…Good luck to you all and hope 2012 is a big one for all of you readers. Very timely information to think about. You’ll notice how many politicians (note I did not say “political leaders, because I do not believe our elected officials are acting like respected leaders in any way, shape, or form!) and various government agencies are grasping at every tiny potentially positive bit of news about the economy to put a positive spin on it. Look at the hoopla about every time a few less people apply for unemployment benefits, or a few houses sell for a bit more than the general market. The comments you reference about news media reporting what people want to hear is, not what the reality is, should frighten all of us. Real reality is that the world is broke financially. The day of reckoning has been pushed back for decades, and now it’s here. Entirely agree that sudden changes can happen. Resiiiency is the name of the game, on many levels. Add in the particulars of this time, such as the massive creation of dollars and that oil is not so easy to come by, and we have the makings of quite a drama. And who knows what or when? In science and skeptical circles, that would be called confirmation bias – here’s a few memorable examples – therefore a trend is claimed. Psychics loves this one remember this hits and forget the misses. The best example is the old ‘toilet seat up or down argument’. The man puts the seat down and remembers it because he went to the effort of doing it, the times he didn’t put it down he doesn’t count because he didn’t remember to pay attention. The woman sees the seat up constantly and counts it against the man, whenever the seat is down, she would assume she did it and thus doesn;t give the man credit. In the end they both claim ‘what always happens’ and think they have supporting evidence. I had no idea that you studied or followed Elliott Wave Theory (EWT). Social trends and therefore economic trends follow distinguishable patterns in the form of waves, known as Elliott Waves, which were discovered by R.N. Elliott in the earlier 1900’s. I spent over 10-years studying and researching EWT prior to getting into Internet Marketing. I literally spent thousands of hours studying charts and researching related methodologies, foremost the Fibonacci Sequence, which EWT is based on. My programming partner and I also developed a trading platform that systematizes and automates most of the analysis involved in trading based on Fib and EWT. At some point we want to productize the trading systems and various pieces of the overall trading platform and then launch it into the trading niche properly. I say properly because when we tried to do this several years ago before we knew anything about Internet Marketing, we failed miserably. That’s one of the main reasons we got into the IM game to begin with. It then took on a life of it’s own and we’re still doing it. We do continue to use our trading platform to do automated trading on our own accounts, but that’s about all we’re doing with it right now. Our goal for 2012 is to hopefully put together a full development team paid for with our Internet Marketing profits and then pull the trading platform back out and do it right! It takes a lot of time and money to build this sort of software and we did not have that properly in place the first time around, which is why it took us so many years to accomplish what we did. Chris if you (or anyone else for that matter) are interested in finding out more about our trading systems and software platform, feel free to connect with me. I absolutely love talking about this stuff, especially EWT and Fibonacci. FYI, I am in the top 100 Expert Elliotticians world-wide to apply EWT and Fibonacci Analysis to trading. Bob Prechter of the Elliott Wave Institute was at the top of the class when I got started and I studied under him for several years. Well, what I seew in the chart is that all the positive views were right in the end. Just try to find a 40 year interval in which You would have lost money…. All it shows is that todays habbit of trying to make short term profits with stocks is gambling…. Real reality is that the world is broke financially. So which planet is our money on then ? rich, while the vast majority on planet earth is suffering from hunger ! 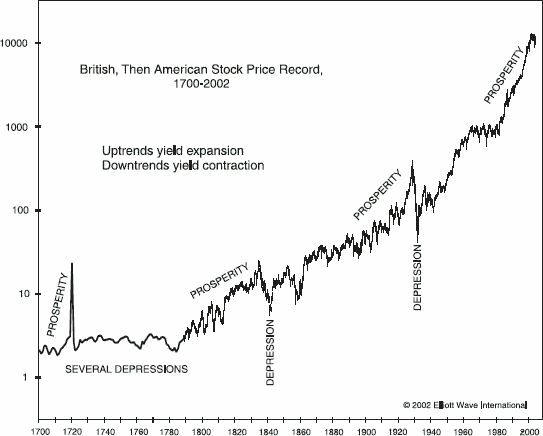 Well after the peak in early 1700s it was over 100 years before it reached those peaks again. I’m in no way suggesting that is on the horizon. But there is no proof that suggests something like that could not happen again. Gains from the 1940s also look much higher due to inflation. In real terms the gains are much smaller than they appear, which also means the time taken to recover from losses was longer than the graph suggests. Ultimately what I am saying is just because over the past few decades recoveries have come quickly, does not mean that is what always happens, nor does it make it any more likely that that trend will continue. Believing so is just another example of extrapolating the current trend off into the future. It is true that the trend of ongoing growth has been pretty solid, which in many ways is essentially just a reflection of the success of the human race as a species. This is a graph of inflation, soon to be hyperinflation. central bankers would like you to think of inflation as “prosperity”. i tend to disagree. Robert Prechter (founder of Elliott Wave, from where that Great Chart originates) is one of my Heroes. He might be one of the most knowledgeable financial analysts alive. He’s had some BIG wins. Yet he’s also had a few bombs. Like he got out of the 1980s stock market boom — which he was among the VERY few to predict — way too soon. But he had the guts to publish and extensive analysis of WHY he had been wrong to get out. I think he called that ultimate top pretty close, too. I also bet he wishes he had gotten far more into gold & silver and for a lot longer. I suspect gold might actually return to a more widely accepted monetary unit, meaning the sky — or the quantity of all fiat money of all nations combined — is the limit!!! … Holy Cow! … But he does say everyone should own some gold & silver, no matter what, just in case the governments of the world continue on their current trajectory. The Lesson there, I think, is it does not matter HOW smart and experienced you are, the markets are nothing to mess with if you are not ready to absorb some big let-downs. But if you do proper Risk Management, you should be able to at least take small positions without too much damage if things don’t go your way. More importantly, though, is using Market Analysis to understand the world we live in, regardless of whether you are actually in the markets themselves or not. Even if you live in a cave in Afghanistan , we are ALL in the The Big Market, one way or another. It’s especially true of economics, but the overall social mood determines whether we get into wars (HMMM, maybe ESPECIALLY if you live in that Afghan cave), have civil unrest or riots, whom gets elected, or even if certain kinds of products are more or less likely to sell. So I think learning at least something of the Prechter Social Mood hypothesis — see link below* — would be VERY beneficial to marketers. It would appear, Chris, that YOU might be the Guy to put a course together on applying Socionomics to Marketing??? … Sociomarketing? I would love to do something like that, but I’m tired of doing everything alone. And I keep getting stuck on technology issues with my little websites! Bummer! Anyway, Chris, I’ve been moving You WAY up on my list of Must Pay Attention to Marketers, and this and similar posts of yours really made a big difference in that rating! Thanks for All Your Great Work! * See Socionoimcs.net with lots of good stuff . Under the menu tab “Learn About Socionomics,” look for Histories Hidden Engine and watch the video.